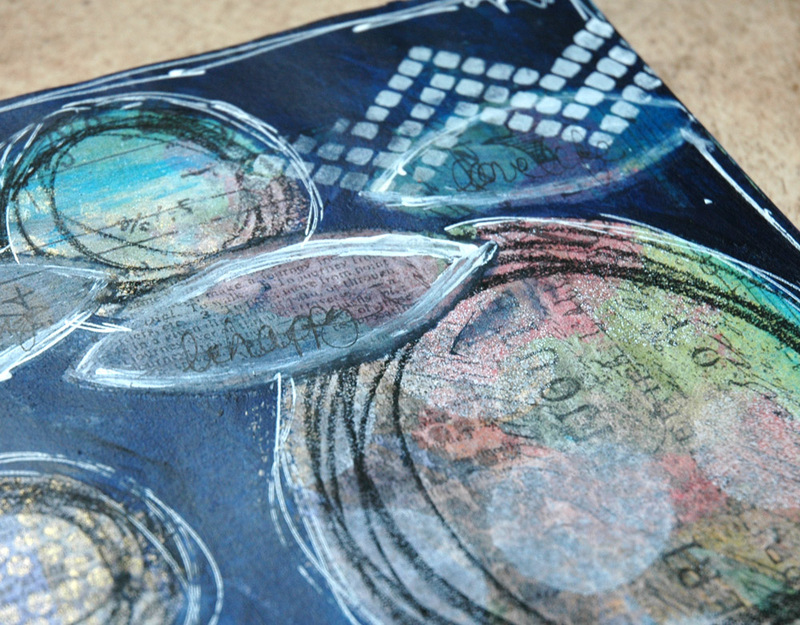 I was playing in my Art Journal this morning, trying out gelatos (fun times!) and making a watery mess. Usually, once my background is done, I’m stuck. 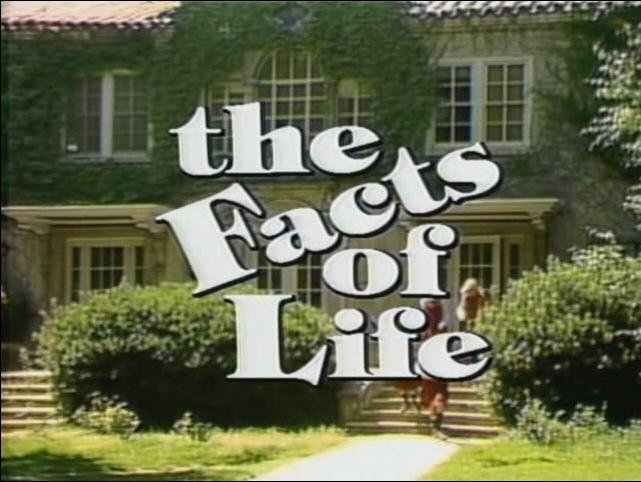 Not so this morning, my friends! Then, I messed up the mouth. And in trying to erase it a little, all the paper tore off. Now, let’s be honest here; if I was the patient type (I’m not) and if I had waited for the background to dry properly (I didn’t) I would have had some nice, dry cardstock to work on and none of this would have happened. If trying to fix the mess of the mouth and torn paper, I destroyed her nose. Sigh. Seriously world? Come on already! 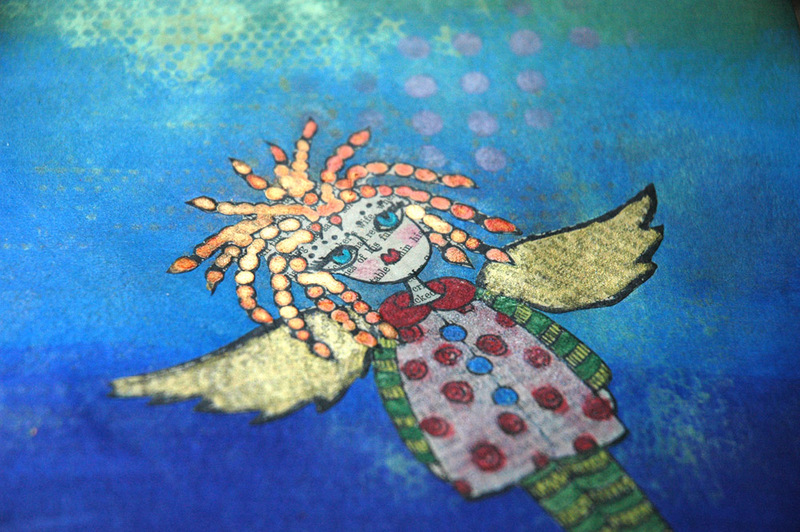 A Donna Downey stamp, a line of journaling under that, and a bit of Payne’s Grey Golden paint (totally in love) over a stencil and I called it fixed and done! I had an interesting conversation with a friend the other day and she said she didn’t like colourful backgrounds behind faces – she couldn’t get past the non-flesh colour. 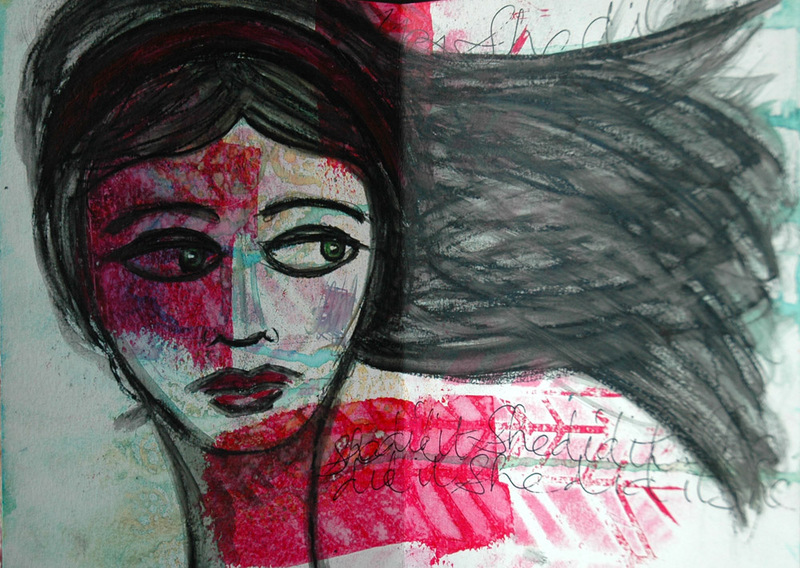 Making this I completely realized that what I like is the unusual colours, I don’t want flesh colour – I like the interest the background work gives the face. What do you all think? Do you prefer the norm or the oddball colouring? I did make a double background so hopefully, when I go to work on the next page, the wet factor shouldn’t be an issue! 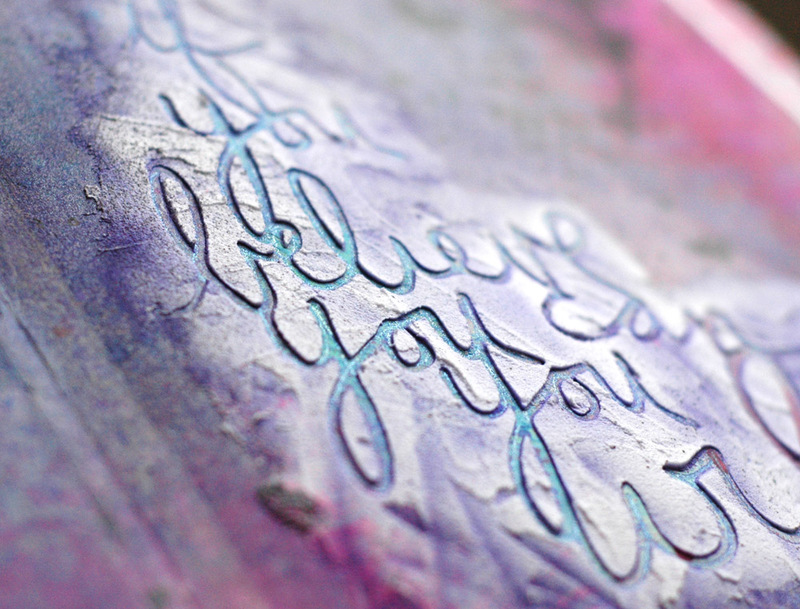 While Dina Wakley was in town teaching in all her fabulousness last weekend we all got into a small conversation about Art Journaling – is it really Art *Journaling* if you don’t journal? And I don’t journal – I play. So I decided to push myself and start. I have actually added some journaling to almost all my pages and have enjoyed every second. Then I took some of my unfinished pages and went to work on them. This is one of my faves – I love the background so much that it has taken me this long to cover it up! I always tell classes when I teach, “Don’t get attached,” and I got attached. It was time to bite the bullet and move on. And aren’t all those layers and doodles fun? I’m totally inspired to keep journaling now, and am more excited than ever to play and make a hot mess – after all, there’s always a way to turn it around! 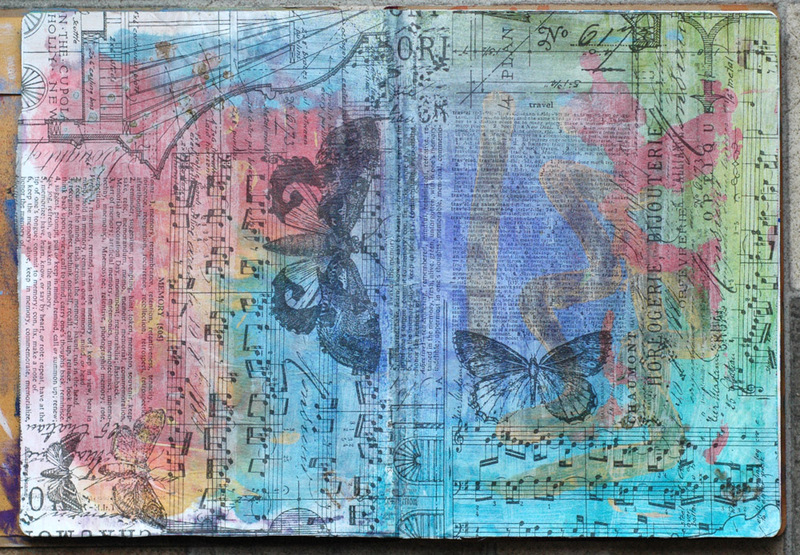 This Art Journal page didn’t turn out as planned however, since I didn’t have a real set plan in mind anyway I guess that was to be expected! 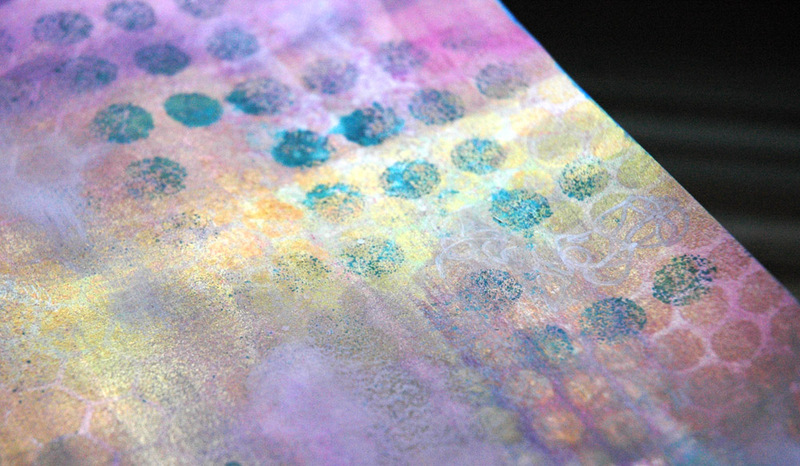 I started by just spraying some new mist colours and then layering stencils over. Then I went to a new project. 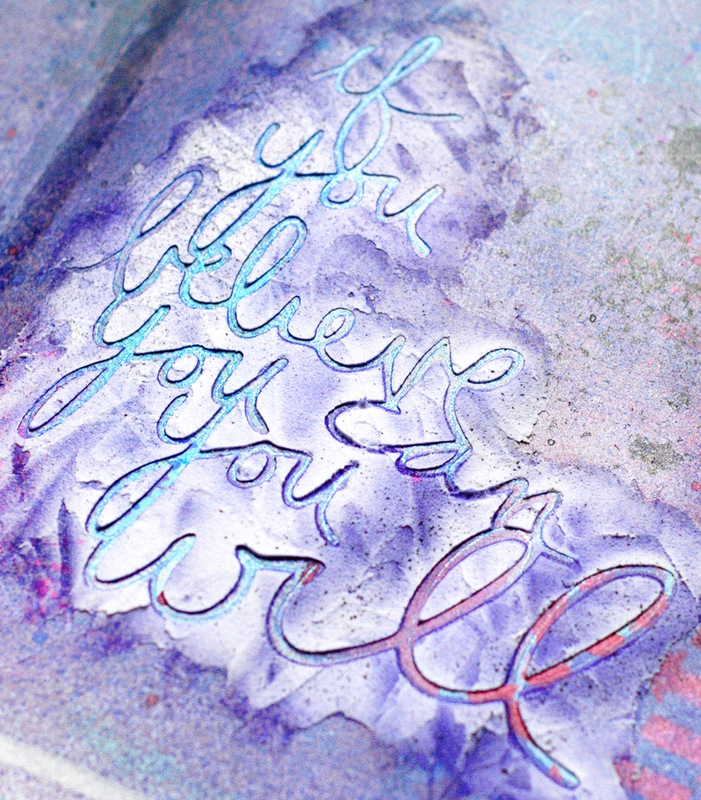 I came back and misted the “if you believe” stencil but it didn’t stand out like I wanted it to so I traced the words with my Sakura blue Stardust pen. Still no good. So I left it again. 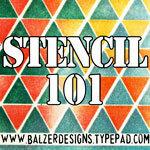 This time when I came back I used Golden Light Molding Paste over the stencil and that did the trick! Until I wanted a punch of black and got overspray on the molding paste. Sigh. But the dimension is still cool. I just threw my hands up at this point and called it done – let’s move on already! Even if this is a hot mess, it was a fun hot mess to make! A bit of this, a bit of that – and some tissue wrap for good measure! 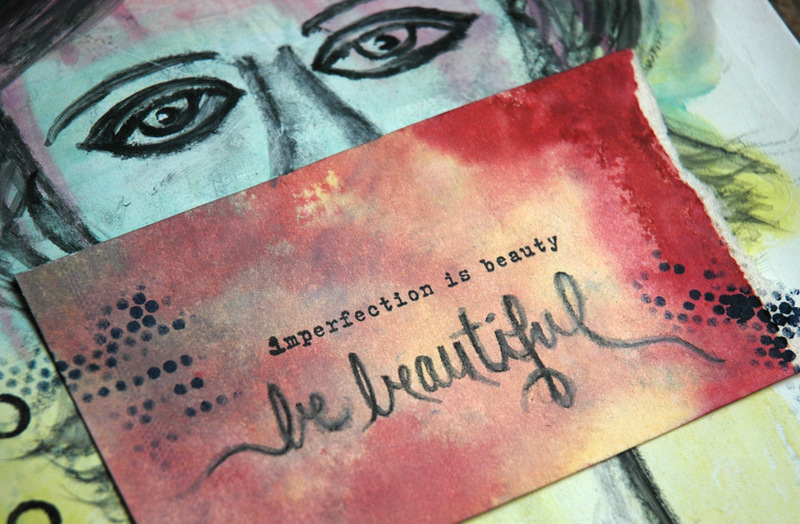 While I was at the Paperie Retreat last weekend I demoed some products for the girls who were sitting close to me. 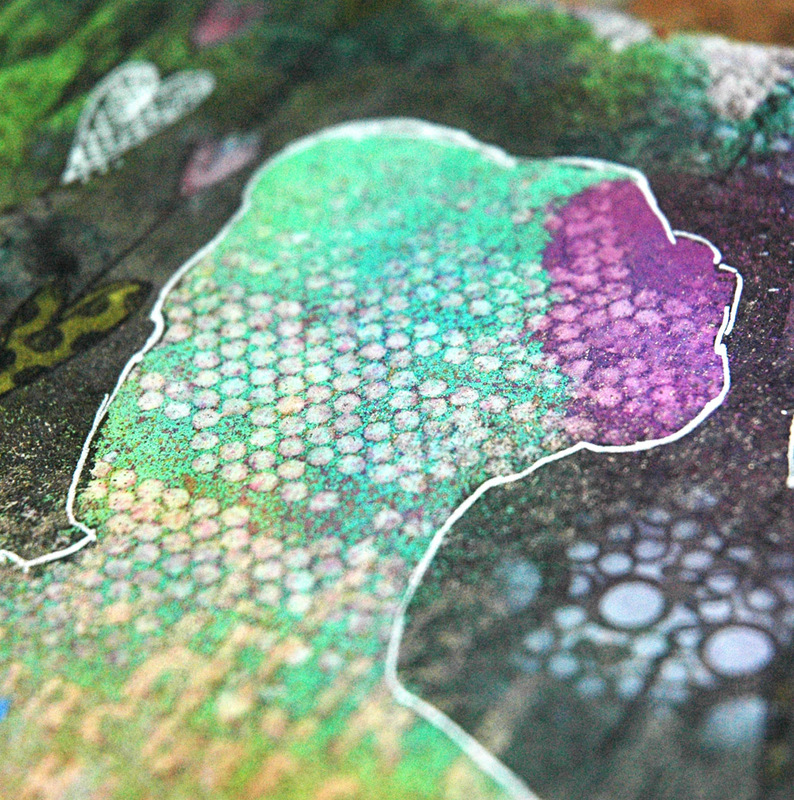 And the demoing got done in my Art Journal. A bit of Distress Paint marbling, showing how easy it is to clean the dabber tops of said paint, a bit of mist, some primary elements, molding paste through a stencil… You get the drift. It’s enough to say that those two pages were a disastrous mess once I was done. Seriously. I should have taken a picture, I thought there would be no redemption for them! Then I had the brilliant thought to tone down all the vibrancy and clashing colours and chaos with some Ranger Tissue Wrap. And it worked better than hoped. So well in fact that I don’t want to cover it up – I love it now! 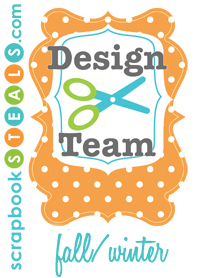 Don’t you think this would make an awesome scrapbook page background? 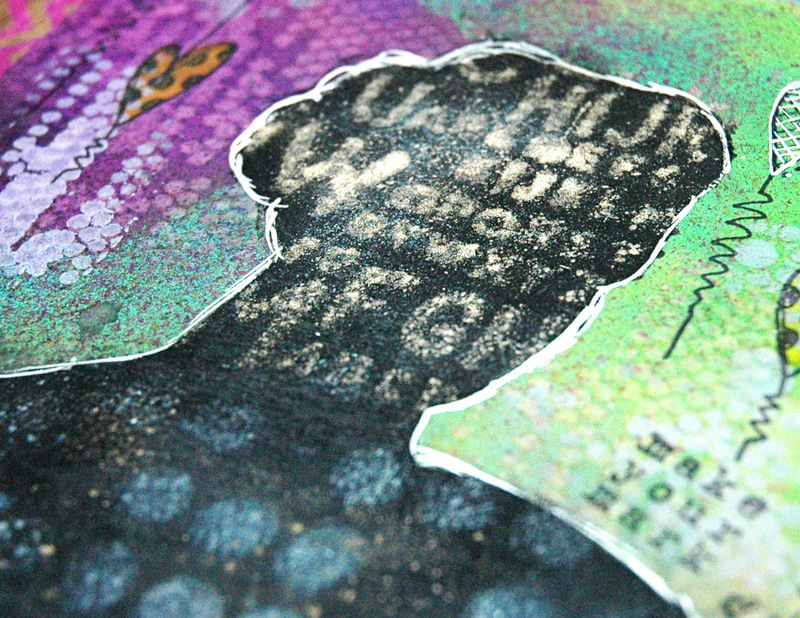 Even the random lines and squiggles add to the texture of the base when they’re pushed to the background. 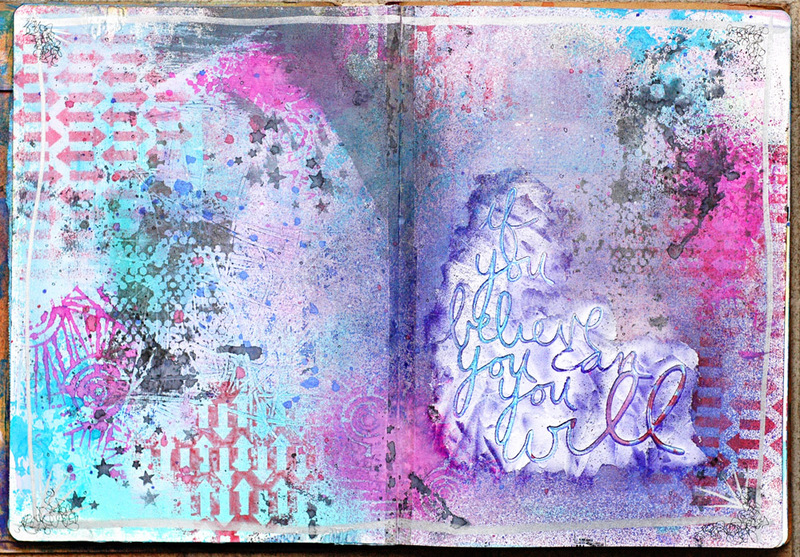 For a soaking wet, colourful mess of random stuff, this ended up being an awesome success – yay for playing in Art Journals! 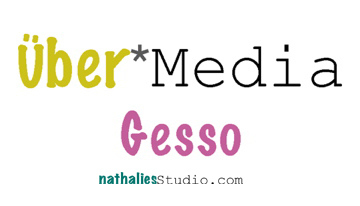 update: I finally finished the page and covered my beloved base layer – see it here! 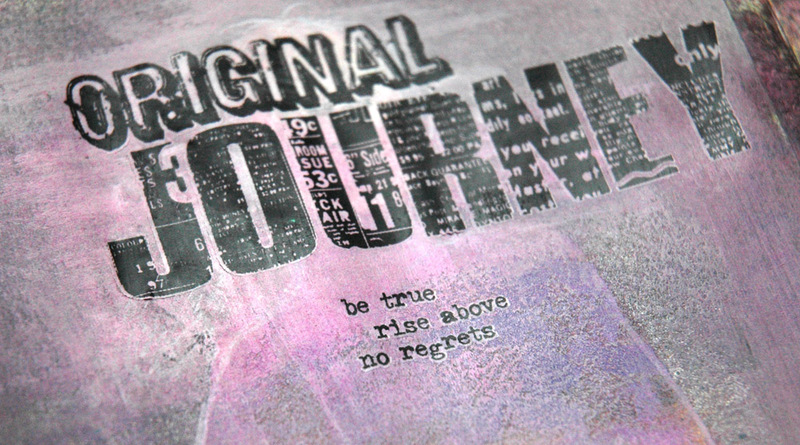 be true. rise above. no regrets. EDIT: I set this to post (or so I thought!) yesterday. Obviously that didn’t happen so you get to enjoy two today! 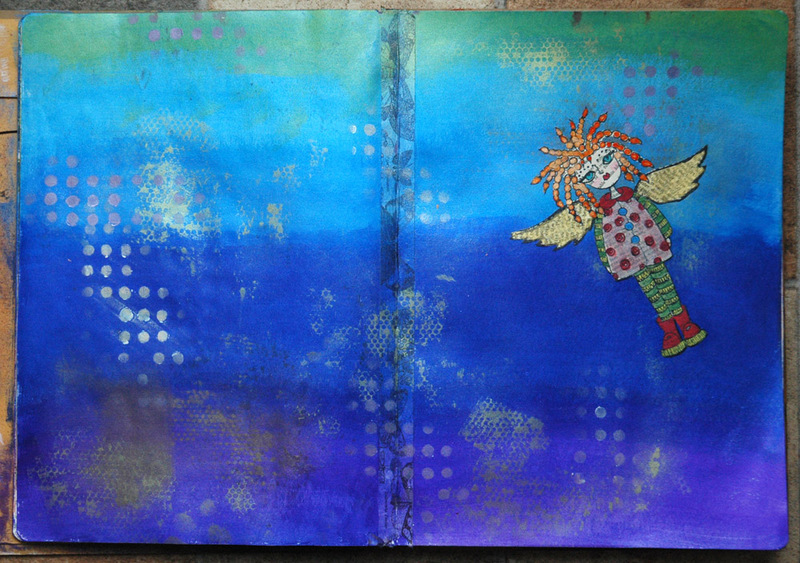 While preparing for my Yearlong Album Class this weekend, I was playing in my Dylusions Journal with a background idea. 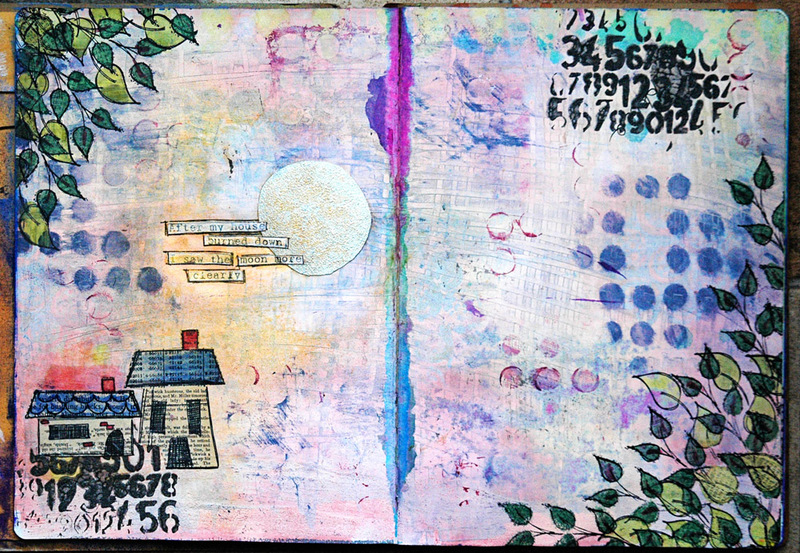 Since then, the final product has changed greatly, plus I’ve added a lot of different elements to this page, but working in an Art Journal is an awesome way to test out new ideas and see how stuff reacts. And it never does what I expect it to do! 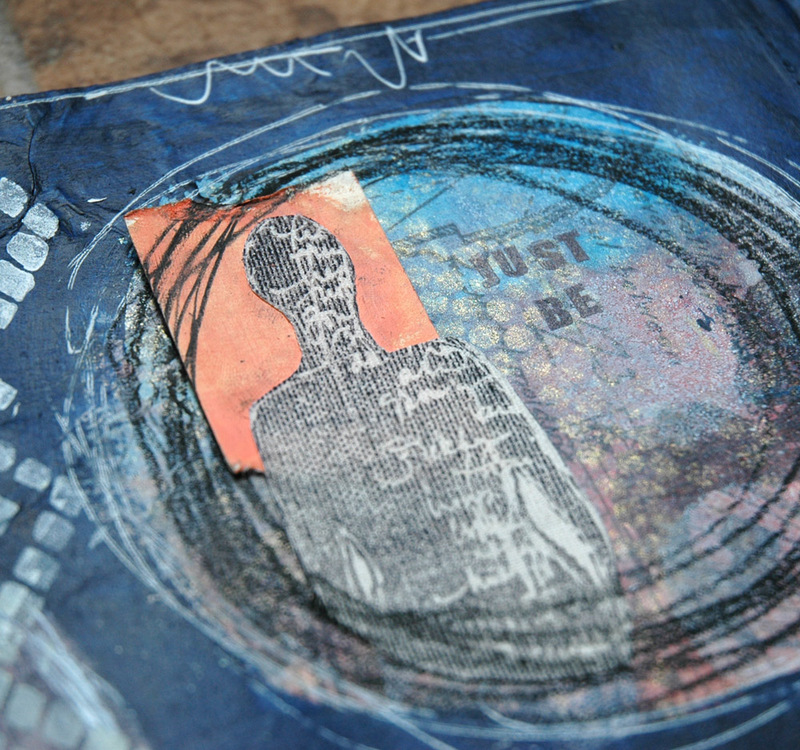 Art Journal, Dina Wakley, Donna Downey, Dylusions, Julie Fei-Fan Balzer, Mixed media, The Crafter's Workshop, Unity Stamp Co.
As soon as The Paperie received the Sally Carly stencils by Dina Wakley for The Crafter’s Workshop, I had to give them a test run – along with the Tiny Circles and Pie Chart stencils designed by Julie Fei-Fan Balzer and Ronda Palazzari, and a couple of Dylusions ones too. 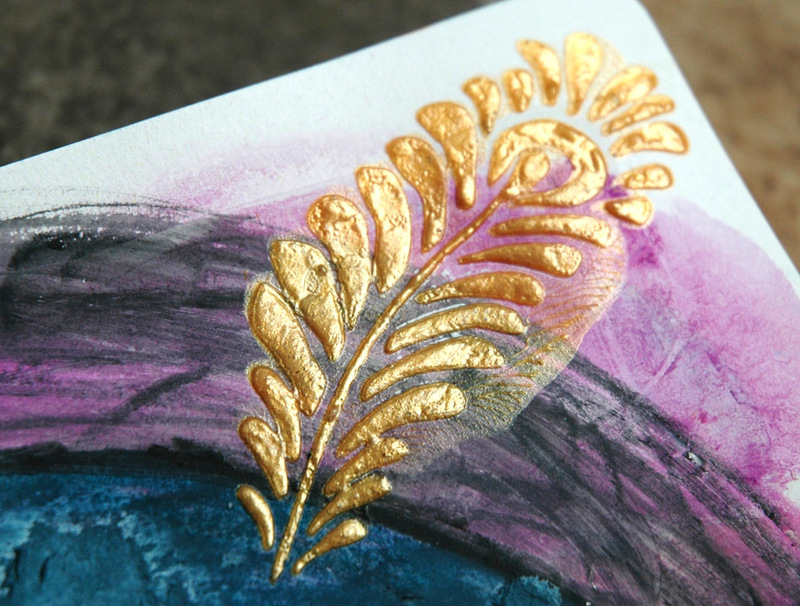 To begin, I re-enforced my journal seam with gold chevron washi tape and I love, love, love how it resisted the mist on the gold parts! 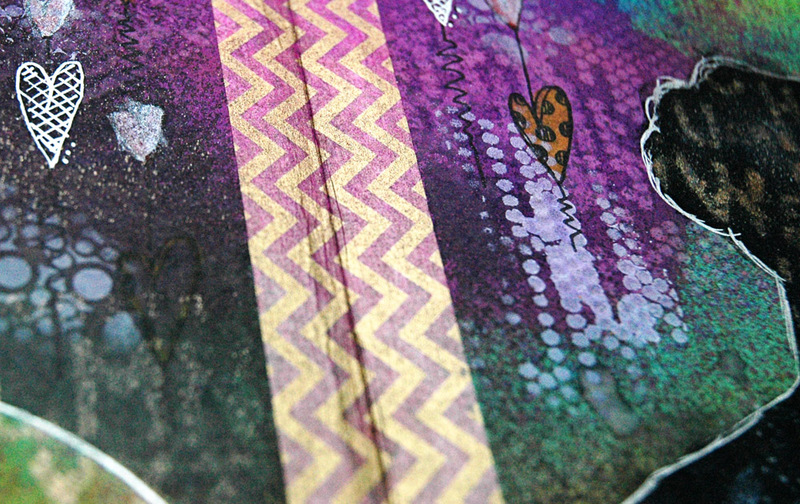 That was completely unexpected because I just grabbed the first washi tape at hand and stuck it on – awesome surprise! 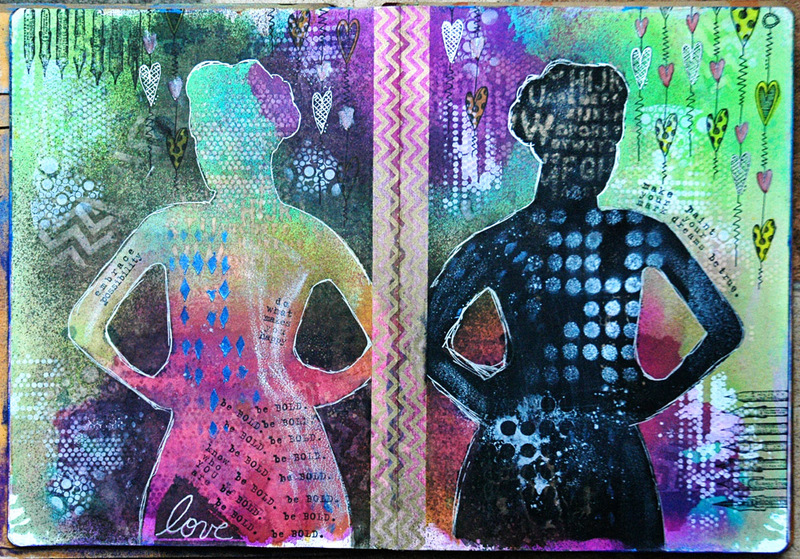 I used both the positive and negative pieces of the stencil to get different layers of colour with Dylusions Ink Sprays and black gesso. 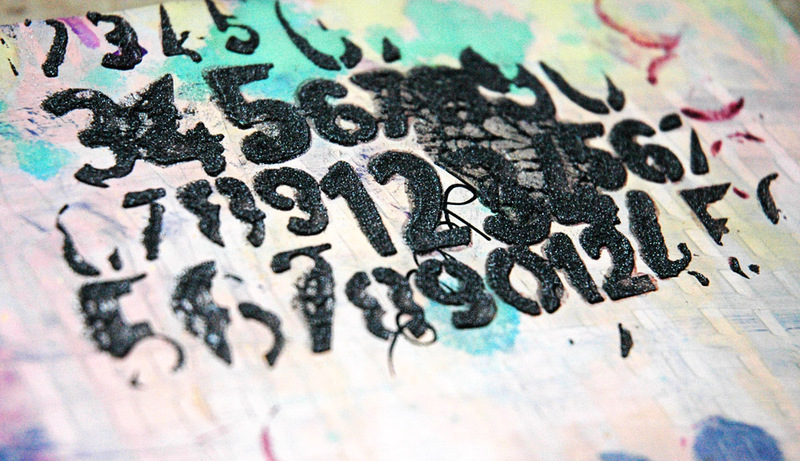 I also did a lot of outlining with my white Uniball Signo Gel Pen, some stamping in black archival ink, and layers of white gesso, Inka Gold, and shimmer mist through the other stencils. 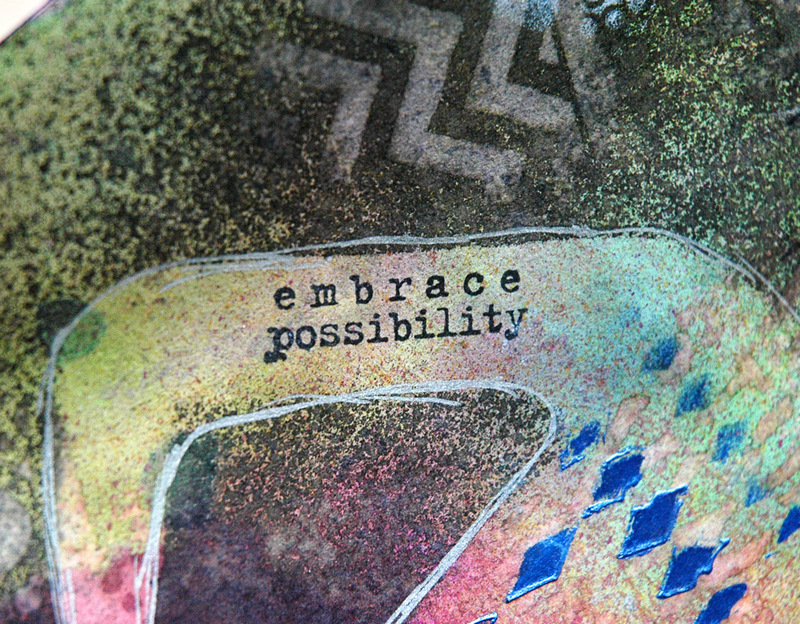 Finally, I added Donna Downey phrases from her Art & Possibility set, available through Unity Stamp Co. 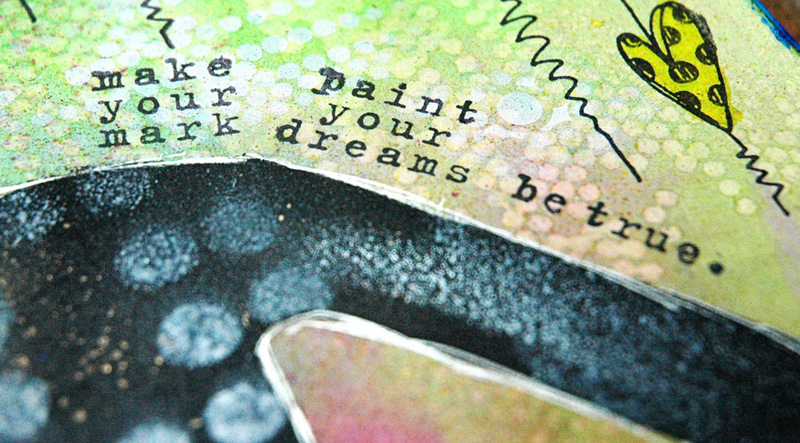 This may be my new favourite stamp set – the sentiments are fabulous! 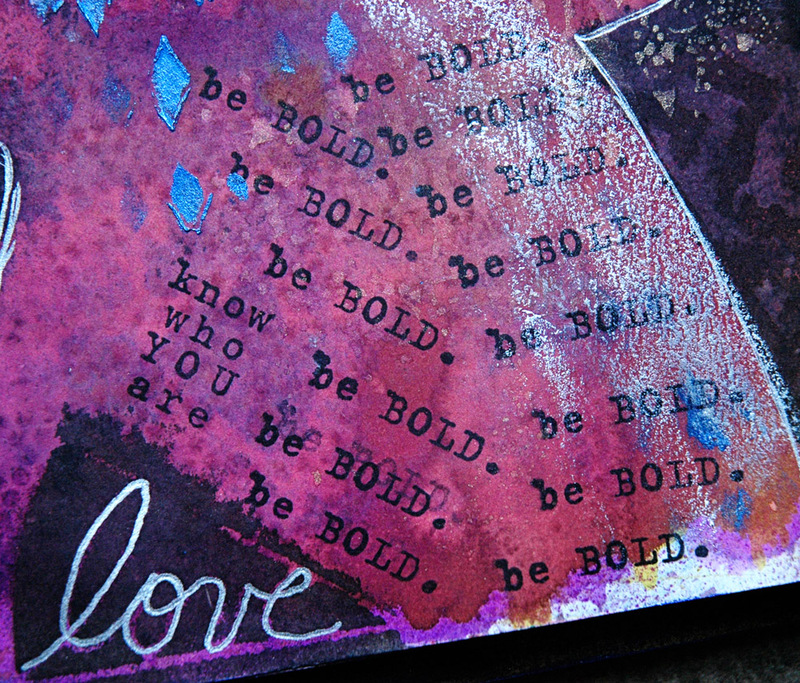 All in all, I’m pretty happy with the results – and I really love all the stencils and media that came into play! What fun things have you done this week? Link me up in the comments – I’d love to see it! 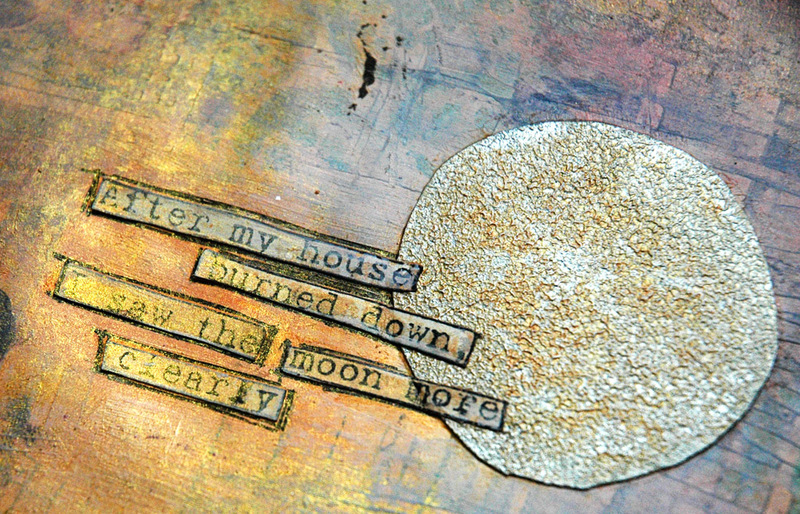 I saw the moon more clearly…. 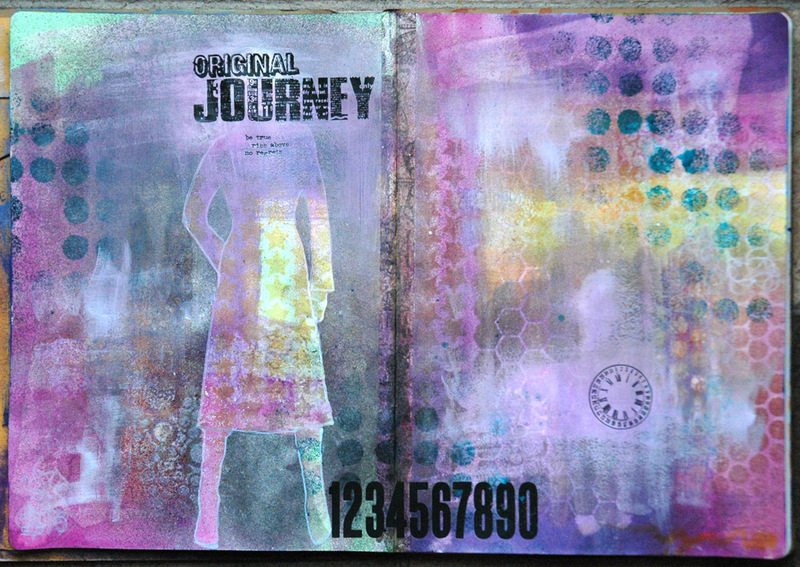 I have to say, this art journal page didn’t turn out as I envisioned. Probably because it started out all wrong, and then got covered up, and then…… You know, everything snowballed and the end product was vastly different from what I had originally been going for. 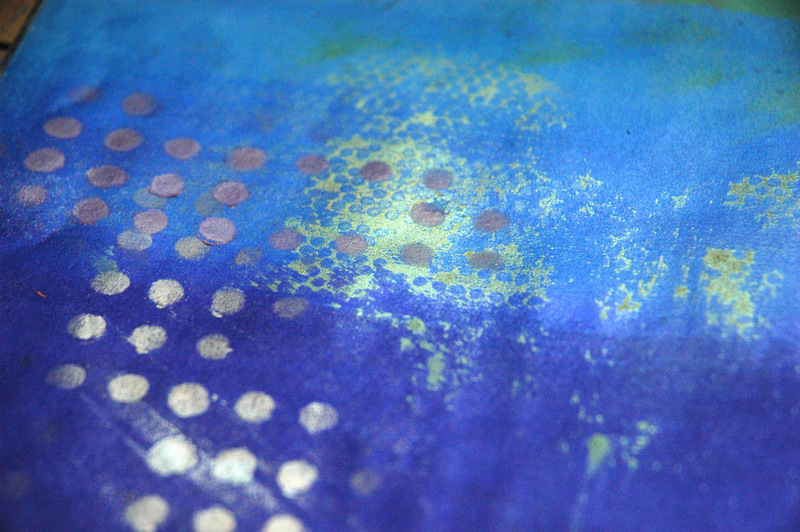 And I ended up with the same colours I started with, just much more subtle and with a lot more interest and texture. I also stamped some of my favourite leaves, added some more mist through the Dotted Flowers stencil, and paper pieced some houses on vintage book paper. All in all, I’ll live with it. After all, isn’t experimenting the main thing here? 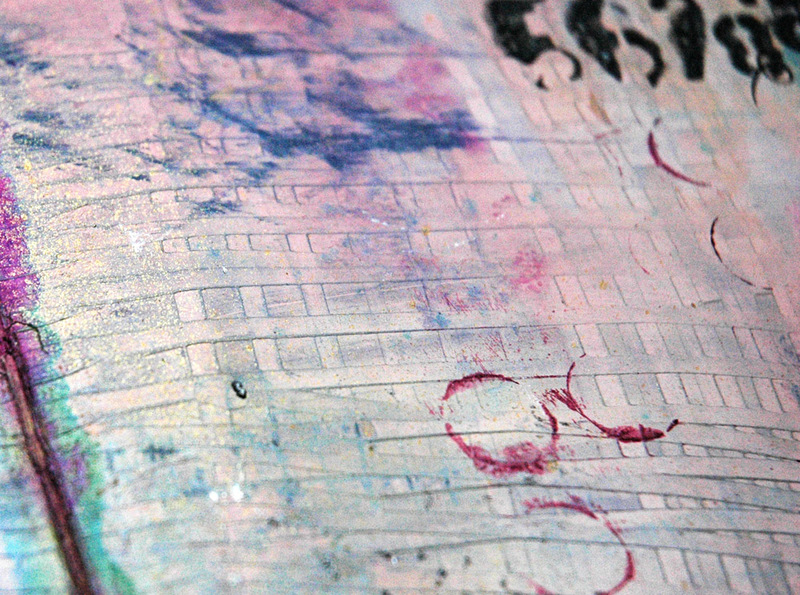 I also learned to put tape on my journal seams, as you can see from the colour that seeped through from a later page. Luckily, I don’t mind the extra pop of colour here but I won’t be taking that chance any more and am having fun now playing with different washi tapes. You’ll see some of that next week! What have you done this week? Any fun things to link me up to and show me? You know I’d love to see it!